My Opinion: 7.1 || A clockwork thriller that delivers a beautifully filmed heist sequence and great cat-and-mouse tension. The characters are standard hardboiled types, and some elements of the plot don’t hold up under close scrutiny, but Melville manipulates everything with tremendous aplomb. SYNOPSIS (Courtesy of IMDb): Corey is a cool, aristocratic thief, released from prison on the same day that Vogel, a murderer, escapes from the custody of the patient Mattei, a cat-loving police superintendent. Corey robs Rico, his mob boss, then enlists Vogel and an ex-police sharpshooter, Jansen, in a jewel heist. While Corey is harried by the vengeful Rico, Mattei pressures Santi, a nightclub owner and pimp, to help him trap the thieves. Over all hangs the judgment of the police director that every man is guilty. Strengths: Melville is masterful in using silences, and the centerpiece heist rivals the similarly taut and quiet sequence in Rififi. Although the film moves at what could be considered a slow pace (and isn’t short), the story never drags. Melville gets the hook in early and reels us steadily in, jerking the line at just the right points. Weaknesses: There are a few far-fetched coincidences, lucky breaks, and dangling threads. And Corey assembles his high-performing heist team with a little too much ease. Melville attempts to establish a philosophical touchstone — the police director’s contested assertion that every man is guilty — that’s not well supported by the surrounding story. Characters/Performances: There’s a difference between well defined (which these characters are) and three-dimensional (they aren’t). For the most part, Melville doesn’t try — we get zero back story on most characters — and when he does give it a go, most notably with Yves Montand’s alcoholic sniper, it’s more of a gesture than a full attempt. Best Moment: The heist. 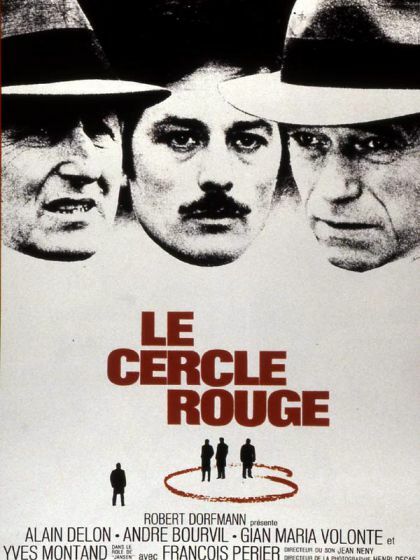 Maybe not quite as good as Rififi’s but clearly influenced by it and nearly as tense. More evidence of the cinematic power of silence.